I've been waiting and planning for Pam's latest fabric with Holly and Lakehouse. This line is everything I love in fabric and Pam and Holly have a hit on their hands. Friday I received a fantastic package with cuts from all Pam's line "Pam Kitty Love". Look at that stack! Yummy. This line exceeds all expectations and it fits perfectly with the drawings and ideas I've been planning for it. The fabric will be out in stores in December. 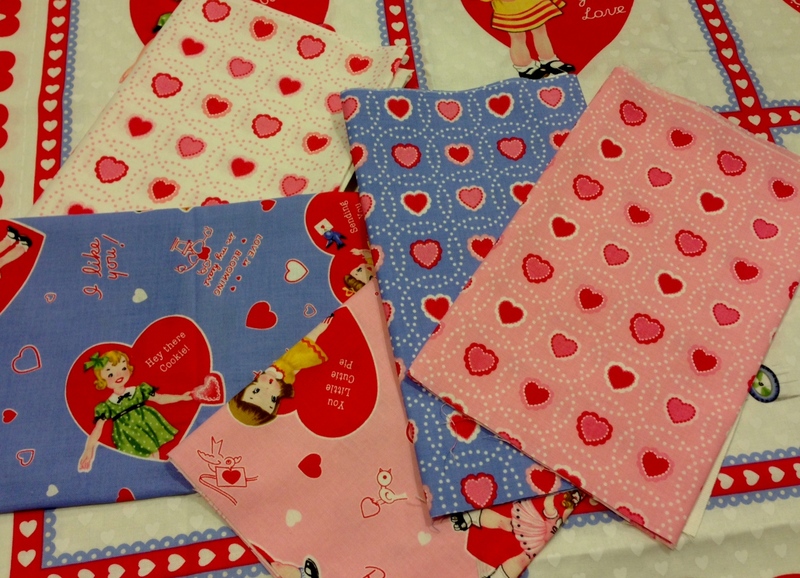 This will give everyone plenty of time to sew after Christmas and make Valentine projects. 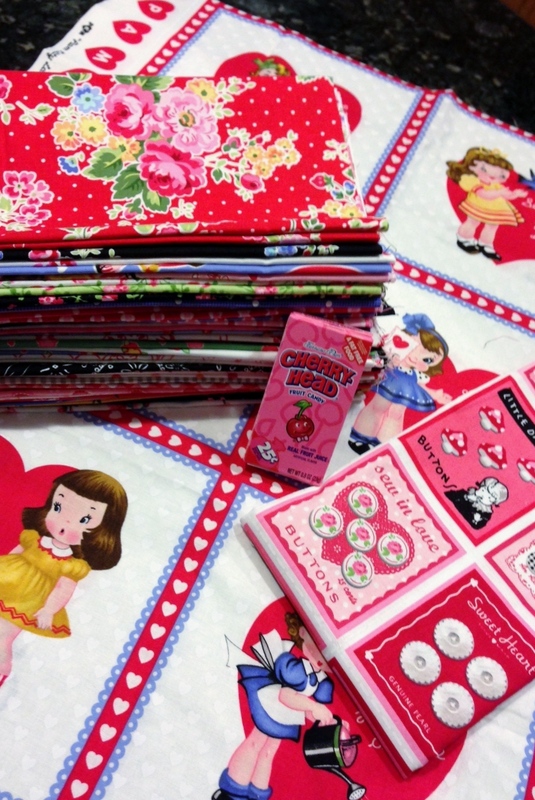 I adore vintage inspired Valentine fabric. The hearts and stitching print is very sweet. I am super excited to have the addition of black into this line of Pam's colors. One of my very favorite cuts is this little bird print. Too tweet! 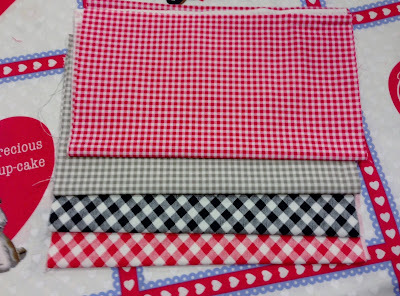 I love dots and gingham. This line has a very nice mix of both. 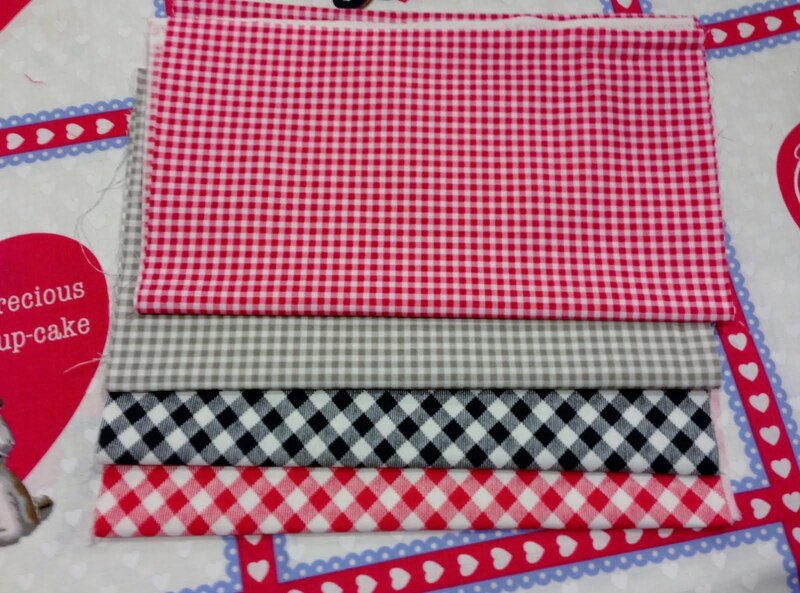 I like the 2 sizes of gingham and the addition of the gray. 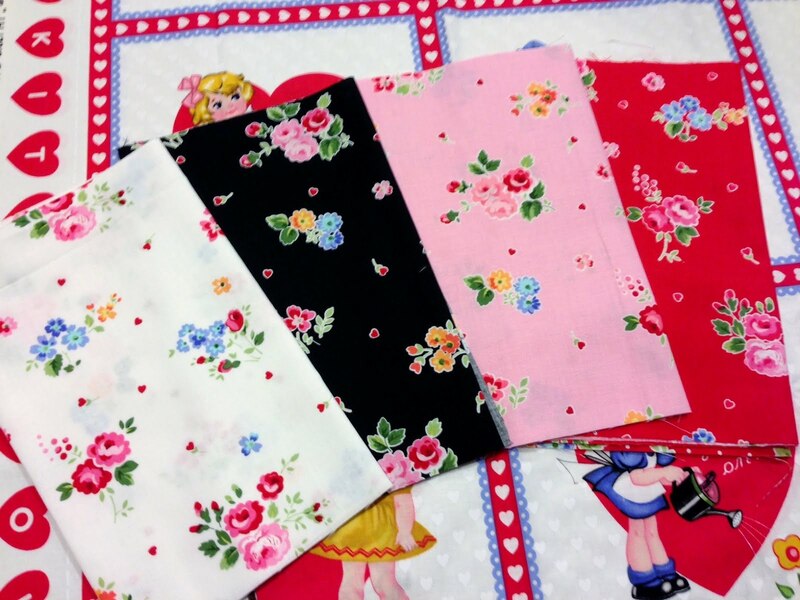 I do really enjoy roses in my fabrics. As a girl, I was drawn to roses in fabric for the dresses my mom would make. These prints are so pretty. Little Nanette would have loved a dress made from that blue. This print is another very favorite from this line. I like the mixture of different flowers together. 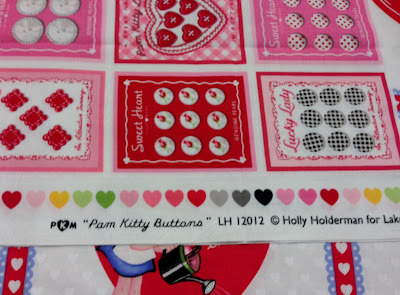 This is a block from the quilt I'm making with "Pam Kitty Love". I've planned a new quilt pattern with this fabric so I have high hopes that this project will do the fabric justice. The center is an appliqued circle using one of the ginghams. This center in this block may look like I sewed on a real button. 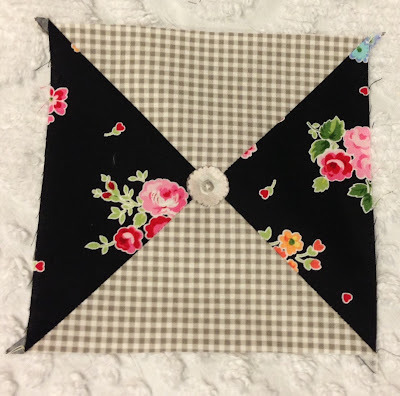 But I fussy cut it from the button panel and then hand appliqued it to the center of the block. This fabric is sew versatile. See how different the blocks look with the center "buttons" changed? 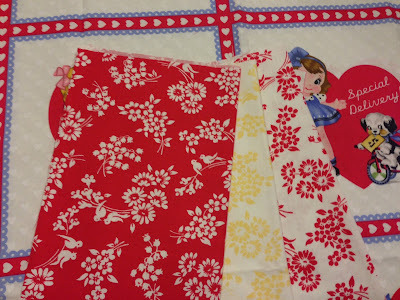 Can you guess the theme of my new quilt? Here are all the designs in this line, above. Visit Fat Quarter Shop or LakeHouse to get a better view of the sweet fabrics. I just adore them. Thanks so much Pam!! Sew delightful. The fabrics are gorgeous. I can't wait to see the things you make with them! When I look at Pam's fabrics, I see your face. What a team the two of you make! Oh dear....trying my hardest not to buy any new fabric, but I think this one is to hard to resist!!! I'm loving what you're making. not sure what the theme of your quilt is, but a theme of your quilt is straight up AWESOME! i can tell already. 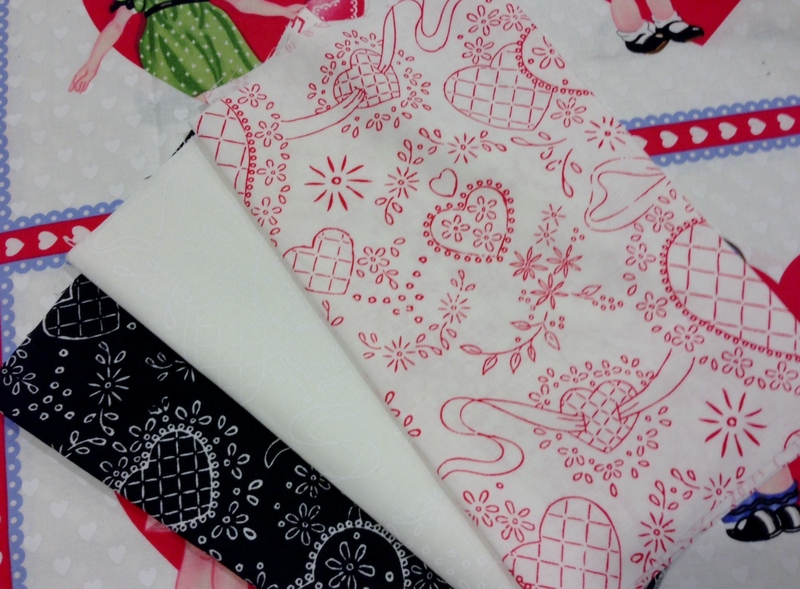 Oooooh, that fabric is SO pretty! And I LOVE those blocks you've made. Sooo cute!! Every single piece from the line looks like it will be my favorite. 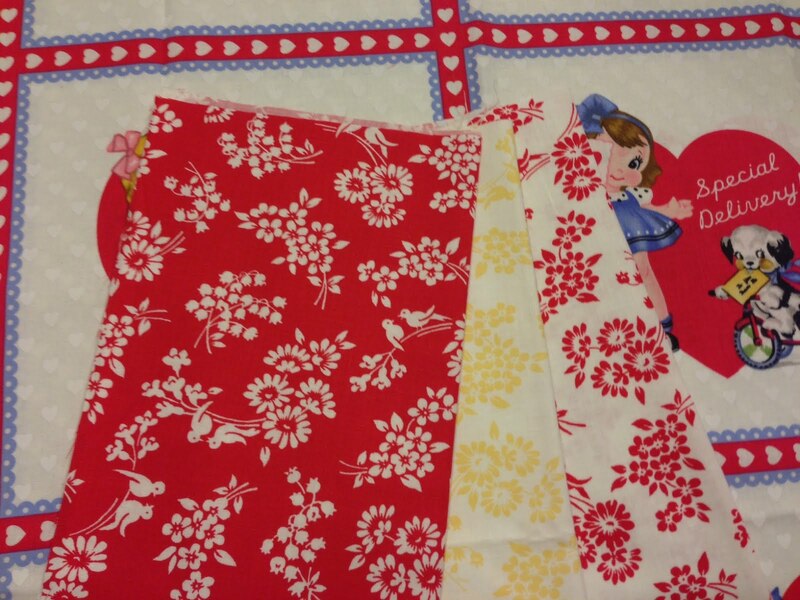 Oooh a new quilt, is the theme buttons? maybe bows? Oh, my goodness! I love every fabric in that line. You are a lucky girl to have some of it to play with! 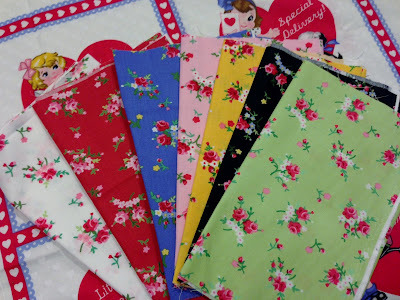 I am going to have to get me some of this as it reminds me so much of the fabrics from the 50's and 60's that I loved to sew with! So happy you like!!! I can't wait to see what you make! Wow, I can't wait to get my hands on some of this fabric! I love it all. oh no! Here we go again. I finished my quilt with your row x row w/PKM fabric and better finish the quilting quickly so I'm ready for the new blocks. Her fabric and your blocks make my heart sing. So pretty! CAn't wait to see your finished work! Great fabric for sure. I really like your block! May have to steal it for a piece I want to do!! I love PKM's newest line of fabric!! You are so lucky to already be able to play with it. And I can't believe that it isn't a real button in the center of those cute blocks. 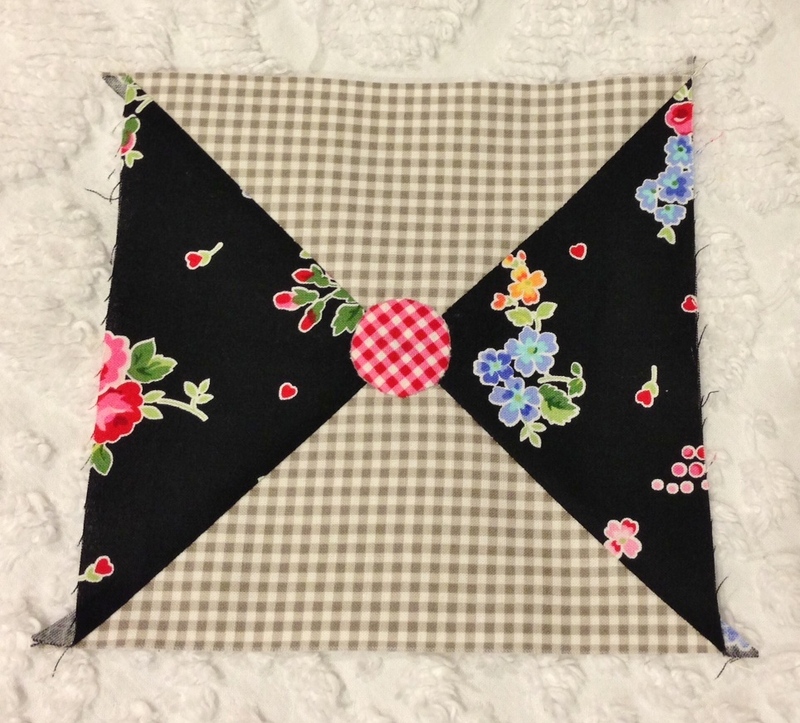 A lovely fabric story - exciting to see what you do with it, Nanette! Fabulous fabrics--so many nice ones! Have fun with them--lucky you!